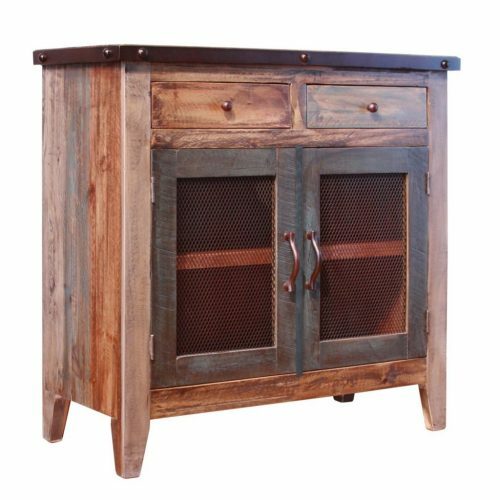 The Antique Multicolor Server features solid pine construction, beautiful nail-head trim on metal band around tops, and multi-step hand rubbed finish. 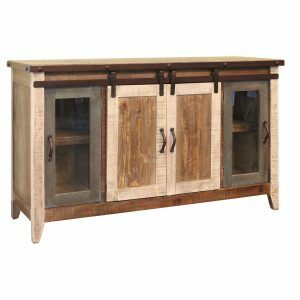 With only 35″ in height and width, this unique piece is a beautiful functional accent that will add storage space to any room. Multi step hand rubbed finish. 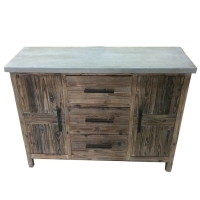 Has a soft multi color finish to resemble real recovered wood. Solid wood is hand brushed painted and given a final clear lacquer nitrocellulose coating that protects colors and is smooth to the touch. 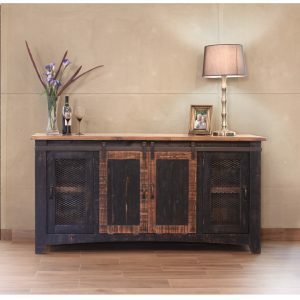 With only 35" in height and width this unique piece is a beautiful functional accent that will addstorage space to any room. Use it as a server or small bathroom cabinet. Two functional drawers and one shelf behind iron mesh paneled doors. Drawers feature metal ball bearing glides.